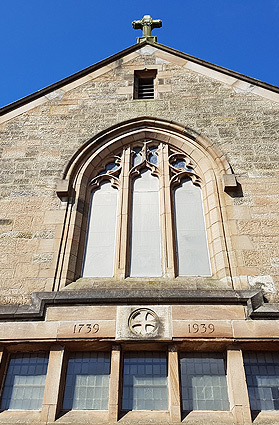 In 1739 a congregation of worshippers from Mearns, Eaglesham and Neilston formed and decided to build a church in Newton Mearns. The new building took four years to complete and so every Sunday for those four years the congregation travelled to the village of Kilbarchan until the new building was ready for use. A further three years passed before the first minister, Revd Andrew Thomson, was ordained and settled in the new church. The present church building is the fourth church to be built in Newton Mearns and the second to occupy the site since the first church was built in 1743. The increase in the population of the Newton Mearns area in the 1930s meant that the existing building was not big enough to meet the needs of the growing community. It was therefore decided to demolish the existing building and rebuild a new and larger church on the site. Occupying the prime location at the cross where the roads from the north, south, east and west met, the building of the new church attracted great interest in the local community. The building was completed in 1939 and the church now has the capacity to seat 729 people. Many items were donated to the church from local people, including the offering plates now used for collecting retiring offerings as the congregation leave the sanctuary. The children of the congregation in the 1930s collected and raised the money for these plates in much the same way as our present Junior Church children raise funds for their special projects. The church was formally opened and dedicated on 16th December 1939 by a former Moderator of the General Assembly, Dr Black. 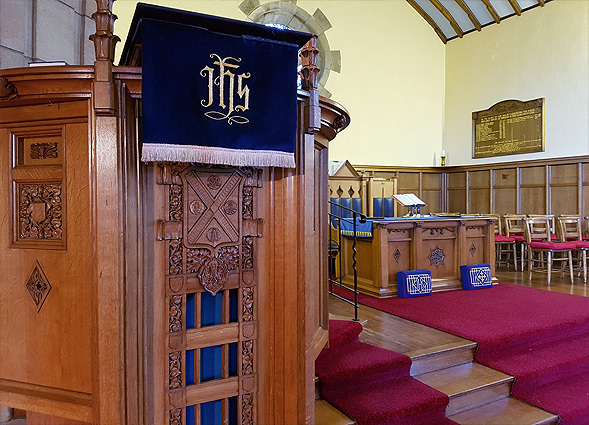 While the new building was being built, services were held in the Old Hall which was built in 1924. Because of the size of the congregation, communion services were conducted in two main sessions, one in the morning and one in the afternoon and the congregation were allocated to the sessions alphabetically. When the Second World War broke out in 1939, the new church building was the focal point for the community and the Old Hall was designated as a rest centre for anyone needing shelter. After the bombing of Clydebank in 1941, some of the survivors were accommodated in the hall until permanent homes could be found for them in the district. The church also ran a canteen in the hall to serve the military camps in the area. It operated from August 1941 until February 1945 and opened on Tuesday, Thursday, Saturday and Sunday evenings as well as Sunday afternoons. Parcels and messages of support along with socks, scarves and gloves knitted by the Women’s Guild (who produced over 3000 items) were sent to church members serving in the forces. In December 1947, the Kirk Session decided that the church should commemorate the lives of those who died during the war and in addition to a stained glass window in the gallery, the tower and electronic bells were dedicated as a memorial to those who gave their lives during the Second World War. To this day a wreath is laid at the memorial every Remembrance Sunday as part of the service. The growth in membership of the church and the increase in youth organisations put added pressure on the resources and so the Memorial Hall was commissioned and was opened formally in 1976. December 1999 saw the celebration of Newton Mearns Parish Church’s diamond jubilee marking 60 years of the present building.